It's totally original! | In which I blog about trying to pursue being a writer. I'm reaching for the stars! Space travel is hard. It’s been a long time, blog of mine. Like, a few months. I know. Ok, wow. I just went back and checked – it’s actually been six months. six months. Half a year. Ugh. I had kind of like a meltdown, you see? I hit that year mark and just…well, it wasn’t great. Floundered for a few months, beat myself up emotionally, and then started to take the baby steps towards the Right Track and getting back on it. So now I have a job. It’s a pretty good job, too, I think. And it’s only part time, so I’m hoping I can regain some discipline and create a schedule where I can actually finish a second draft, instead of just nervously circling my printed stack of a first draft and darting in for a quick edit and never making any real progress. So yeah, that’s where I am. It’s a rainy day, it’s the second day of March, and I want to keep trying to do this. I want to try. So let’s try. Things haven’t been great, guys. A little less than a month ago, I hit my year mark. A year since I decided to take time off from work and pursue writing seriously. Things kind of imploded at that point. An entire year had passed, and what did I have to show for it? A tiny, wrinkled stack of a first draft, pages stained with wine and coffee, notes scribbled in margins and in between lines, pages curling from being carried around so many times. It’s so small, just a tiny pile of papers bound together with a couple alligator clips at the top. It doesn’t look like a year. It hardly looks like anything. And what do I have ahead of me? A mountain of revisions. Feedback from critique readers. More revisions. Querying for an undertermined amount of time. The work yawns out ahead of me, a dark trail stretching out for who knows how long. If it was easy, everyone would do it, right? But I know I could have done better, could have worked harder this past year. I feel like I failed. Like I failed myself, like I failed my husband, who’s been working hard to support the both of us; I feel embarrassed, knowing I’ve told people what I’ve been trying to do. I thought I’d be farther along by now. But I didn’t try hard enough. So now I’m looking for a part time job, but I’m scared, because it’s been a year. It’s going to be hard to get back into it. I think beginning to earn money again will ease some of my anxiety, but I don’t know where to apply, or what to do. I feel so lost. I could sense depression sinking back in, a black trickle pooling up inside of me. I visited my therapist last week for the first time in a year in an effort to dig my fingers into it, to grip it and attempt to get it back under control. I’m exercising every day now, logging my food to make sure I eat enough and eat healthy. It’s easy to slip into depression, like sinking backwards into a bathtub, water slowly rising over your ears, your eyes, your face, until sound is muffled and sight is blurred and everything is coccooned in a sort of numbness. It’s easy to sink into that. It’s harder, sometimes, to resist it. To fight back. I’m trying, and I’m not trying. I want to work on my draft, and I’m not working on my draft. It sits undisturbed on the table where it’s sat for a week now. I stare at it. I hate myself. I look at job listings. I go to the therapist. I stare out the window and do nothing. Today I plan on going back to Panera, where I haven’t been in weeks. I’ll bring my draft and my laptop and my notebook and my pens, and even if it’s only for an hour, I hope to get some work done. Moving an inch is better than not moving at all. And the logical side of my brain’s responses. Anxiety Cat, batting at string: What if you never finish it? Logical side of brain, staring at Anxiety Cat over the frame of their glasses: As long as I try, as long as I keep taking small steps every day, I’ll get there eventually. If I never finish it, then that means I quit. Anxiety Cat, knocking a glass off the counter: What if it’s horrible? Logic-Brain, grabbing the broom: That’s what revision is for. Anxiety Cat, coughing up a hairball: What if nothing ever comes out of it, and you just wasted over a year on this project? Logic-Brain, taking a sip of espresso: I still learned a lot this past year, no matter what. I completed a novel, and that’s not nothing. It wasn’t a waste. Anxiety Cat, dropping a dead mouse on the rug: Fine. This is for you. Logic-Brain: Honestly, what is wrong with you? Cracking knuckles and preparing to tackle. I’ve been dealing with making any sort of progress with my second draft; I’ve been dragging and kicking and just not getting anywhere. And I’m sitting here at midnight with a glass of red wine and my draft in front of me, and I realize something: with my first draft, I mowed through it. Don’t stop for anything, I told myself. It’s okay if your first draft is terrible. It should be terrible. It’s your first draft. But I’m not on my first draft anymore. And every time I’ve sat down to write, I feel this tightness in the dip of my throat, and type a few words before I end up online or watering my plants or talking to my dog. And just a few minutes ago I realized that my second draft isn’t my first draft (obviously), and there’s this sort of trepidation, this nervous tip-toeing I’m getting around it, because I told myself the first draft could be awful, and that I just had to keep going and not to stop for anything, but now here I am and…it’s the second draft. It feels a little more serious. I’ve been overthinking everything, belaboring over small details; I’ve barely made a chip in the face of a granite cliff. I think I need to take on a bit more of my first draft mentality here: I have the rough bones to work with here, so now it’s just a matter of starting to put them all together and make them look a bit more spiffy. So. Time to tackle this second draft with a bit more shoulder and force and less mousiness. *cracking knuckles and getting into tough guy stance* Ya hear that, second draft? I’m coming for you. Received my first rejection today. I mean, I’ve only sent out one query, and my manuscript isn’t even ready yet, so it’s okay. My query was a mess. And the agent was wonderful about it – very nice about the whole thing. I don’t think I could have picked a better agent to reach out to on my first try, she just seems very understanding and kind. I’m not discouraged, but it was a bit of a wake-up call for me. A reminder that, hey, this is going to be harder than I thought – a lesson that’s hit me every step of the way so far. It was a wake-up call, too, in that I really began to realize the amount of pressure I’ve put on myself. It’s been a year now. A year of me not working, not earning a paycheck. And every day I feel like things have to happen, that something HAS to happen, because I’ve put a year into this now. I applied for a job at a dog kennel this morning, and have an interview with them this afternoon. It’s happening faster than I thought, but maybe working will help me gain momentum again. I’ve been dragging through this second draft, hardly making any progress, and I think part of it is because of the pressure I’ve been feeling. Every time I sit down at my laptop, I see where I’m at, and I know I have SO much work left to go. And it freezes me up a little. Maybe if I start working again, it will take some of the pressure off and allow me to feel more relaxed, more free, less restricted. And maybe some structure would help, too. My biggest fear is that if I start working again, I’ll set my draft aside, and lose the past year. But I need to do something, because lately I’ve started slipping. I haven’t put my all into it. I need to do something to get on track. I want to try my hardest, but for some reason I hold myself back. Lots of things swimming half-formed in my head today, lots of things I’m quietly mulling over, not fully grasping yet, but that I know are there. I just want to make progress. I just want to be able to feel proud of myself, to know I got it done. But how can I want it, and then not seem to be able to get it done? I don’t know. Brains are weird. I confuse myself when I start thinking about how I feel, sometimes. But anyways, just wanted to check in with some of the things I’m thinking through today. Rejection isn’t bad – it’s a part of this writing process. And I had a wonderfully nice, supportive first rejection. But something is holding me back from continuing to make progress. Hoping a job could help, not hinder. I have this printed out and hung up on my wall. I see it throughout the day and it’s always a solid reality check for me. When I have unproductive days (or weeks), this is the quote that burrows into me, quiet and collected, ringing true. 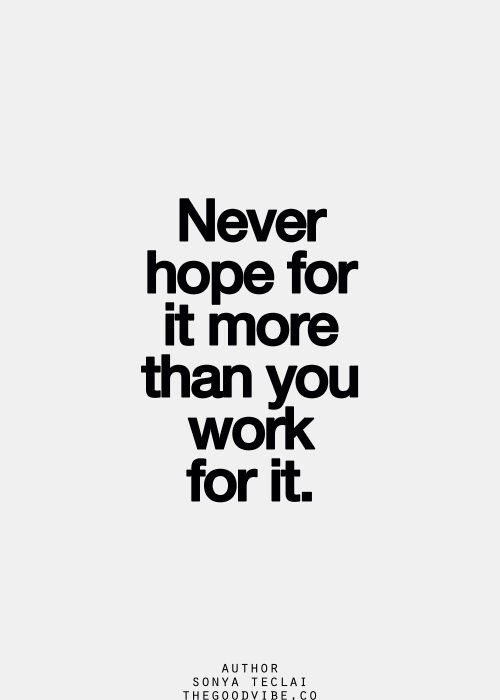 Never hope for it more than you work for it. If I don’t put in my best effort, how can I dare to expect anything more? No really. How is it July? It’s so easy to do anything other than writing. And it’s not because I don’t love to write. It’s just that there’s this big, tangled, messy ball-of-yarn cluster of thoughts and emotions and fears in my head, and there’s this coffee-and-wine-stained, scribbled-over, wrinkled first draft printed out and stacked next to my laptop, and a yawning, indeterminate stretch of work sprawled ahead of me that looms like a dark path going into the woods and it’s all dark and mysterious, and I freeze every time I attempt to stare down it down. So. What have I been doing the past couple of weeks? Oh, you know. A little of this, a little of that. Made some DIY deodorant over the weekend. Currently have some homemade cayenne/onion/garlic bug spray straining through a paper towel on the counter. I keep Scrivener up on my laptop with my second draft open, and every once in a while I circle it, coming a little close and then backing away, because maybe it might bite. I type in a word or two. Maybe a sentence, if I’m feeling brave. It’s been a slow couple weeks. Progress is being made, but glacially. I’m thinking of getting back into a calendar system like I did with my daily word count during the first draft – writing in how many words I wrote each day so I could quickly see if I was staying on track or not. But since the second draft is more of a tweaking and typing and revising situation, I’ll probably need to go by hours put in instead. Hopefully it will help, because I’ve not been as productive as I could be.